Jalal Talabani has arrived for talks in Syria, becoming the first Iraqi president to pay an official visit to the country in nearly 30 years. Mr Talabani immediately went into talks with President Bashar al-Assad at the presidential palace. The countries restored ties in November after a break of more than 20 years. The visit comes days after US President George W Bush accused both Syria and Iran of fuelling Iraq's violence as he announced his new strategy for Iraq. The US says Syria allows militants to enter Iraq. Damascus denies the accusation, saying it is doing all it can to secure its border. BBC world affairs correspondent Mike Wooldridge says Mr Talabani's visit demonstrates Iraq's balancing act between the US and a country Washington prefers to see isolated. 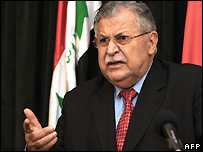 Mr Talabani lived in exile in Syria during the Saddam Hussein era. Mr Talabani's office said on Friday the two presidents would sign a number of agreements on security and trade. But our correspondent says the real question will be how far the visit will be used to discuss US and Iraqi government concerns about insurgents crossing between Syria and Iraq. In his speech on his new Iraq strategy, Mr Bush pledged to cut Iranian and Syrian support for "terrorists". "We will interrupt the flow of support from Iran and Syria. And we will seek out and destroy the networks providing advanced weaponry and training to our enemies in Iraq," Mr Bush said. The White House later played down "rumours" of military action against Syria or Iran. Syria insisted on Friday it was co-operating in "securing and stabilising the situation in Iraq". Damascus and Baghdad witnessed a long period of hostility following Syria's support for Iran during the Iran-Iraq war. Mr Talabani, a veteran Kurdish politician, has been noticeably warmer towards Syria than Iraqi Shia Prime Minister Nouri al-Maliki, analysts say.